3. 8 Problems . . . 66 4 ENABLING REUSE 69 4. 1 Concepts . . . . . . . . 69 4. 2 Exploiting commonality 70 4. 3 Reusable building blocks 71 4. 4 Allowing replaceable components 75 4. 5 Other replaceable entities 79 4. 6 Limiting flexibility . . . 82 4. 7 Other considerations . . 84 4. 8 Language fundamentals 85 4. 9 Problems . . . . . . . . 88 5 FUNCTIONS 91 5. 1 Concepts . . . . . . . . 91 5. 2 Introduction to functions 92 5. 3 An interpolation function 94 5. 4 Multiple return values 96 97 5. 5 Passing records as arguments 5. 6 Using extemal subroutines 100 5. 7 Language fundamentals 102 5. 8 Problems . . . . . . . . 110 6 USING ARRAYS 113 6. 1 Concepts . . . . . . . . . . . . . . . . . . 113 6. 2 Planetary motion: Arrays of components . . 113 6. 3 Simple ID heat transfer: Arrays of variables 120 6. 4 Using arrays with chemical systems 132 6. 5 Language fundamentals 143 6. 6 Problems . . . . . . . . . . . . . . 152 7 HYBRID MODELS 155 7. 1 Concepts . . . . . . . . 155 7. 2 Modeling digital circuits 155 7. 3 Bouncing ball . . . . . . 162 7. 4 Sensor modeling . . . . 166 7. 5 Language fundamentals 178 7. 6 Problems . . . . . . . . 186 8 EXPLORING NONLINEAR BEHAVIOR 189 8. 1 Concepts . . . 189 8. 2 An ideal diode 189 8. 3 Backlash . . . 193 8. 4 Thermal properties 199 Contents vii 8. 5 Hodgkin-Huxley nerve cell models 203 8. 6 Language fundamentals 206 8. 7 Problems . . . . . . . . . . . . . . 210 9 MISCELLANEOUS 213 9. 1 Lookup rules 213 9. 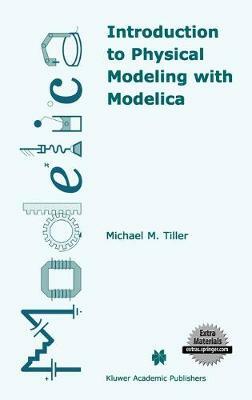 2 Annotations . . 225 Part II Effective Modelica 10 MULTI-DOMAIN MODELING 231 10. 1 Concepts . . . . . . . . . 231 231 10. 2 Conveyor system . . . . .